The Pennsylvania Forest Coalition is a unique alliance of 4,115 hunters, hikers, anglers, landowners, wildlife-watchers, paddlers, bikers, churches and conservation groups who are united in our concern for the stewardship of our public lands. We link these groups together via timely mailings on important environmental issues. DCNR currently manages our State Forests well. 88% of the certified timber harvested in PA is from our State Forests. To retain FSC (Forest Stewardship Council) certification, the forests must cintinue to be managed sustainably and convert a maximum average of 2% of our timberlands to other uses. Additional leasing of our State Forests for natural gas activities will imperil that certification and the 80,000 jobs that depend on it. We appreciate the economic benefit of natural gas activities in Pennsylvania, but the promised number of jobs has fallen far short of industry predictions. Because our landscapes are still scarred from the coal industry (and the remediation is on the taxpayers), we are wary of extraction industries which sacrifice the long-term health and well-being of our communities. A complete and detailed environmental impact study must be performed in order to ascertain the cumulative impacts of oil & gas activities. Mapping locations of rare, endangered and threatened species will take at least three years and require a five-fold increase in DCNR field staff. A baseline study is a must. Any further leasing of public lands could hurt our hunting and fishing traditions. 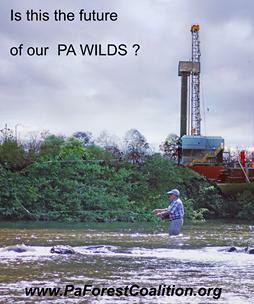 All outdoor recreationists seek natural settings, not industrialized forests like the Allegheny National Forest and the leased DCNR tracts. We want to preserve our rich natural heritage, not raze it for short-term financial gain. We cannot risk damaging Pennsylvania's billion-dollar outdoor tourism industry which relies on 2,500 miles of scenic trails and opportunities for low-impact recreation such as hunting, fishing, birding, hiking and mountainbiking. Pennsylvania is home to Federally-designated Wild and Scenic Rivers, plus innumerable HQ and EV streams which are habitat for our native Brook Trout. Pennsylvania cannot allow our headwater streams to be impaired. Our brookies are the canaries in the coal mine. If you belong to organizations, please list them. & tear on your "Delete" key. 3 ] Simply say "Please Delete from list ____ "
manager that your name has been removed. Sportsmanship: What you do when nobody's looking . ... . . . . . . You could also call it "ethics" or "integrity".